CommonWealth Magazine investigates why Taiwan's national land policies have been stymied and why authorities have sat on the sidelines as the problem festers. The village of Siaolin, nestled in the mountains of Kaohsiung County's Jiasian Township, suffered the highest death toll of any village during Typhoon Morakot in early August. On Aug. 9 at 6 a.m., this lush, otherworldly Shangri-La was buried in a landslide and abruptly transformed into a human purgatory. In a matter of minutes, hundreds of the village's residents perished in the storm. Taiwan's distress, however, is not likely to end there. Hong-Yuan Lee, a professor in National Taiwan University's Department of Civil Engineering, says that based on the latest satellite photos, Taiwan suffered 1,400 new collapsed land sites during and after Typhoon Morakot. He has urged the government to quickly deal with danger spots by preparing to relocate villages, blowing up barrier lakes to release water in controlled flows, and dispatching geological experts to survey the affected area. "How many weeks do we have? Probably only three. September is Taiwan's typhoon season, and nobody can know when the next typhoon will come. This time, only about 600 millimeters of rainfall will be needed to unleash massive mudflows and landslides," Lee says. Lee's warning is hardly unfamiliar. 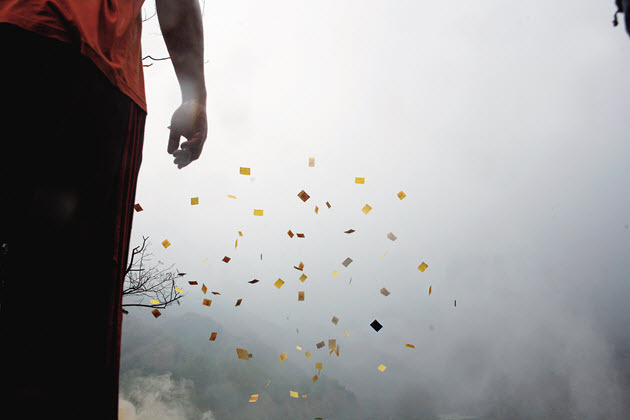 Before the name of Siaolin became deeply seared in the minds of Taiwan's people during Morakot, the names of other destroyed villages – Tongmen in Hualian County, Shenmu in Nantou County, Songhe in Taidong County and Haocha in Pingdong County – had been eulogized after past disasters, leaving people heartbroken every time. Plans for national land-use in Taiwan have been discussed and drawn up for 20 years, but have made little progress. Even villagers with limited educational backgrounds realize that the many plans have been nothing more than idle talk. "Has the draft national land planning act even been approved by the Executive Yuan? And then how much longer will it take after it is submitted to the Legislative Yuan? Is there a tangible action plan? Who will be responsible?" Lee asks, sharply criticizing Taiwan's lack of a comprehensive land planning policy based on a centralized concept. The problem is not that nobody has tried. In 1996, a draft "Comprehensive National Land Planning Act" was proposed, and it was later amended into the "National Land Planning Act" in 2002. The bill was approved by a committee in the Legislative Yuan, but before it could be reviewed by the full legislative floor, it was pulled back for further negotiations between the ruling and opposition parties. Today, the draft bill is still being deliberated by the Cabinet. The executive branch's inability over the past 14 years to persuade lawmakers to approve a national land bill stems primarily from the legislators' belief that the bill's major constraints on land use and development would too harshly impact residents in affected areas. CommonWealth Magazine asked one official involved in drafting the national land planning bill why after a year of discussion the Cabinet has yet to submit it to the legislature. He replied that the administration has continued the policy planning process and listed the bill for priority review, but argued that even if the bill is sent to the legislature in its coming session, the lawmaking body's Internal Administration Committee already has the National Park Law and Coast Law on its agenda, and passing three major pieces of legislation might be too much to ask. As to why the Legislative Yuan has never passed a national land planning law over the years, Legislator Lin Yi-shih from Kaohsiung County was blunt in his assessment. "To be honest, this kind of bill will always be strongly opposed by the affected residents. When the Democratic Progressive Party was in power, we didn't see it promote or defend the policy, and now that the KMT is in power, the bill hasn't even been submitted to the Legislative Yuan," explains Lin, a member of the KMT, which has held sway in the legislature, sometimes in partnership with allied parties, for the entire 14-year period. The lawmaker says perspectives on national land planning are split, with some focusing on economic issues and others on the environment. It's not that the legislature doesn't want to screen the bill, Lin contends, but he wonders if the administration has settled on a clear concept behind the policy. 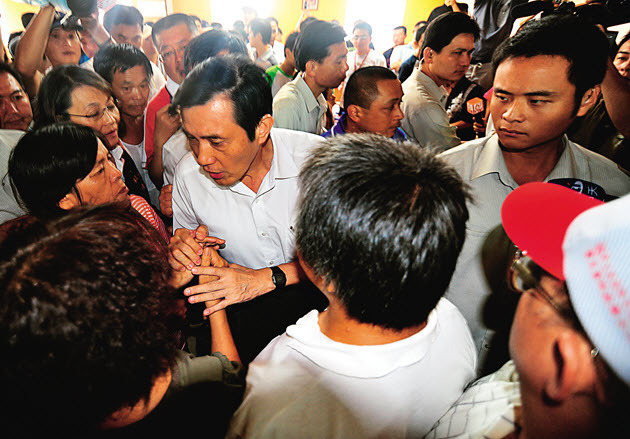 When President Ma Ying-jeou visited survivors from Siaolin, many greeted him with chants of "Down with Liu Chao-hsiuan! Down with Liu Chao-hsiuan!" calling for Taiwan's premier to step down to take political responsibility for the village's tragedy. Ironically, Liu's three main areas of emphasis since becoming premier have been "national lands, energy and talent," and he has given considerable thought to national land planning. At a seminar last Nov. 15 on how Taiwan should prepare for climate change, Liu said that since he had assumed his post in May, there had been a typhoon almost every week, and that within a few short weeks, he had visited around 30 typhoon-affected disaster areas. He noticed that the landscape had changed dramatically and saw devastation everywhere. "I hope we can carry out a few nationwide demonstration plans and promote them widely. If four major plans, dealing with mountainous areas, rivers, cities and coastal areas, can be put in place quickly, I believe it will help national land conservation, development and reconstruction," Liu said at the time. Water Resources Agency director Shen-hsien Chen, one of the Cabinet officials likely to lose his post to take responsibility for the government's perceived bungling of the response to Typhoon Morakot, raised a warning at the end of last year over Taiwan's growing water management risks, a warning that now appears darkly prescient. Citing a 2000 report by United Nations scientists on the potential impact of global warming, Chen declared that the era of heavy flooding around the globe had arrived. 2) Land has been overdeveloped, leading to a major shrinkage of river basins and complicating flood prevention and disaster mitigation efforts. 3) Following the devastating Jiji earthquake of Sept. 21, 1999, in which more than 2,000 people were killed, the volume of sand and silt in upstream sections of rivers in central Taiwan has risen dramatically, and this sediment build-up limits the capacity of rivers to discharge floodwaters. 4) Groundwater continues to be pumped in areas where the ground is subsiding. If this trend isn't stopped, the risk of flooding will increase. It's clear that Liu's administrative team, which includes many PhDs and people with genuine insight, understands climate change and is aware of the issues. That being the case, many wondered why Liu's Cabinet was unable to prevent the Siaolin tragedy, causing Liu's approval rating to plummet to 20 percent in newspaper polls and leading to 47 percent of the people to call for a Cabinet reshuffle. "This administration has knowledge and general ideas, but it doesn't necessarily have the ability to solve problems," one long-time observer says. Has the Cabinet Made Up Its Mind Yet? The keys to the administration's policy execution will be communicating a vision, and daring to confront obstacles – from a politically fractious legislature, to lodge operators who have damaged mountain slopes and resisted land conservation efforts, to aquaculture businesses that draw huge amounts of groundwater in coastal areas, to disadvantaged indigenous people living in national conservation areas. Solutions and complementary measures must be proposed to overcome their opposition. American president Barack Obama faces a similar challenge in trying to promote health care reform in the United States, because the task virtually implies obstructing the means by which others generate wealth. His reform initiative involves doctors, hospitals, private health groups and pharmaceutical companies, and faces the opposition of special interest groups and congressmen lobbied by the pharmaceutical and insurance industries. Yet Obama has continued to appear on television and in public forums to communicate the plight of the United States' health insurance system and the price that needs to be paid to solve the problem. A major obstacle in carrying out national land planning in Taiwan is that nobody is willing to face reality or communicate tough messages. 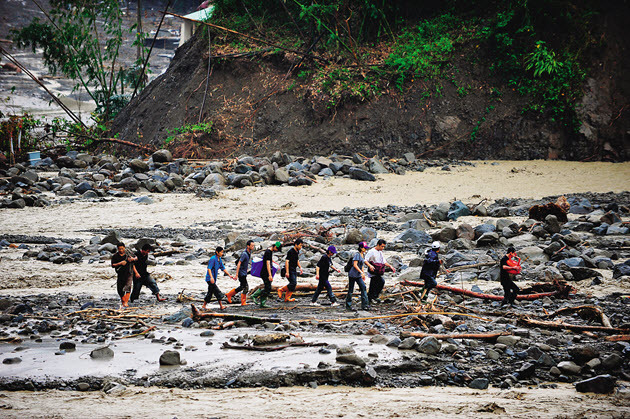 Before and after the Typhoon Morakot disaster, the government's biggest communication challenge was how to use its public authority to get involved in managing private property by limiting land development and even relocating residents away from dangerous areas. In the minds of local residents, land is to be used to grow cash crops, in order to earn a livelihood. But neither the preceding DPP administration nor the current KMT government, nor the populace as a whole has confronted the reality that Taiwan's land is badly scarred and that climate change will bring drought and floods that result in major natural disasters year after year. Jhanghua, Yunlin, and Jiayi counties draw 6 billion cubic meters of groundwater every year, causing Dongshih Township in Jiayi County to subside 12 centimeters a year. One-third of the coastal township of Linbian in Kaohsiung County is below sea level. Meanwhile, mountain areas have been overdeveloped, packing the slopes of river valleys with hostels and hotels. And the problem is getting worse. Yeh Shih-wen, the director-general of Taiwan's Construction and Planning Agency, notes that Cingjing Farm in Nantou County is already overbuilt, with luxury lodges and tourist farmhouses rising higher than ever. Cingjing's geographical situation bears some semblance to that of Siaolin. It lies on a dip slope (a slope of the land surface that conforms approximately with the dip of the underlying rocks, and is particularly vulnerable to landslides) above a river valley, and downstream is the Lushan hot spring area. If Typhoon Morakot's 2,000 millimeters of rain had fallen on Cingjing Farm, a tragedy would have occurred there. "Every time a meeting is held to review land usage and zoning, lodge owners show up to protest, and elected officials voice strong opposition. Taiwan's land has been overdeveloped, but local governments want to encourage more development, and it ultimately becomes a political issue," Yeh says. Even if the government tries to issue a warning, it doesn't dare to say loudly: Taiwan has some places that are not suitable for people to inhabit, and no more building licenses should be issued in those areas. Studying a Water Resources Agency map showing potential flood areas and a Soil and Water Conservation Bureau map showing streams potential vulnerable to landslides, one sees that aside from coastal or mountainous areas, half of Taiwan's 319 townships are at risk of landslides. The next Siaolin could be your own home. When dealing with land conservation issues, former Taipei County deputy commissioner Lee Hong-yuan says, the will of the populace carries great weight, and most people believe residents of high-risk areas are unwilling to relocate. In fact, Lee contends, if the government proposes a good plan, communicates it clearly and includes well thought-out complementary measures to ease the transition, getting people to relocate is possible. He admits, however, that the communication process can be tormenting. The villagers from Siaolin, for instance, have agreed to be relocated to nearby Wulipu, because it is a safe spot, and they will not have to change the mountain lifestyle to which they are accustomed. Harvard Business School professor John Kotter, one of the leading authorities on how organizations change, has argued that the most important steps in achieving a major transformation, aside from creating a sense of urgency and forming a powerful guiding coalition, are to create, communicate and empower others to act on a clear vision. Otherwise, the initiative will likely lead to confusion and contradictions and waste a considerable amount of time, because the open communication process will not have been persuasive enough to ease people's reservations and remove potential obstacles. Ultimately, land planning is not something that can be done behind closed doors. If it is to achieve change, it depends on dialogue, compromise, negotiations and consultations within society. 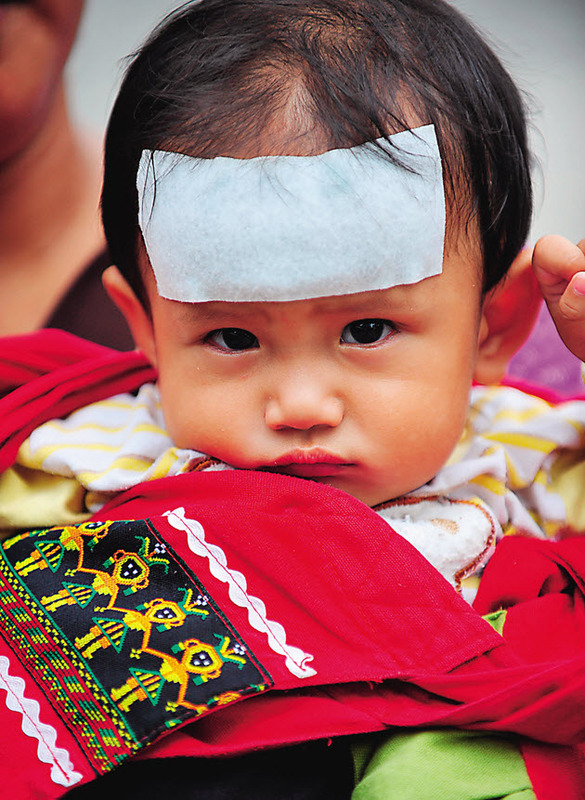 Only then can Taiwan face up to the unprecedented threat posed by climatic extremes. Next Should Taiwan Fear the Dragon?